It is common wisdom that social transfer schemes are an important instrument of poverty reduction and human development. But evidence is increasing that fair and generous social transfer schemes are also important for economic growth and political stability. Social transfer schemes are non-contributory schemes of social protection. They receive their funding from government budgets and, hence, predominantly taxes. This allows them to shift income from those who benefit much from economic dynamics to those who are left behind and potentially criticise policies and the government in general. 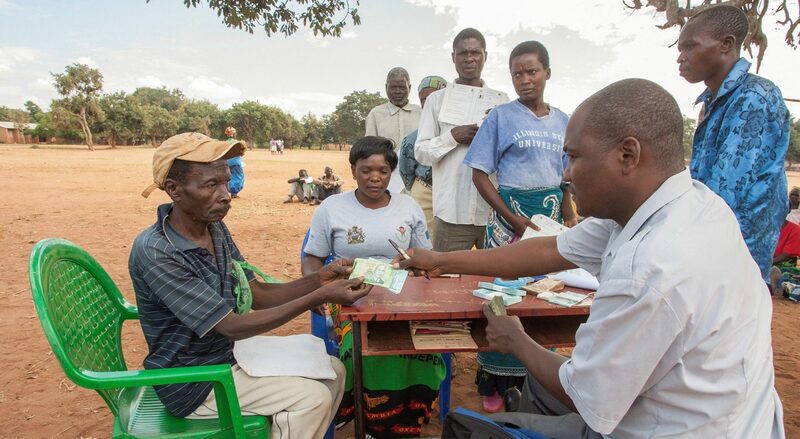 Social transfers can benefit different target groups, depending on specific needs: particularly disadvantaged people, the elderly, incapacitated individuals or residents of specific regions. And they can be tied to specific conditions, such as school attendance for children (cash for education) or working in local infrastructure development for adults (cash for work). The World Bank forecasts that the Sustainable Development Goal 1 (eradicating extreme poverty) will not be achieved by 2030, unless there is a substantial increase in economic growth and a considerably higher redistribution of income to the world’s poorest. This is even more the case for sub-Saharan Africa, where economic growth is volatile, and a very large proportion of people living in extreme poverty. Redistribution can partially be achieved by expanding free state education and health systems, but most fundamentally by putting in place social transfer schemes that provide cash transfers to poor households. For a long time, many politicians have been arguing that developing countries need to grow their economies before they can afford to deliver social policy. However, international comparisons show that even poor countries can afford to have social transfer schemes. On average, they certainly don’t allocate a significantly lower proportion of their gross domestic product (GDP) to such systems than wealthy nations. And in any case, relatively small sums of money can achieve a great deal of progress. Lesotho for example spends 6% of its GDP on social transfers, despite having an annual per capita income of just about USD 1,200. The country set up a social pension system and did so even against the advice of international donors. The system is now considered extremely successful, although it only costs 1.8% of GDP. Similarly, Malawi and Peru have social assistance schemes costing a mere 0.1 to 0.2% of GDP. Ethiopia’s cash for work programme also accounts for just 0.65% of GDP but supports seven million households. It is important to note that social transfers have important effects not only on social but also on economic and political conditions. The 2008 to 2009 global economic and financial crisis showed that countries with effective social transfer schemes performed substantially better in dealing with economic shocks, as social transfer systems tended to prevent a substantial decrease in domestic demand. In addition, the existence of social transfer schemes can particularly help low-income households to invest and thereby free themselves from poverty. People are reluctant to take risks if they have no social protection at all. They keep their savings, rather than investing them, since they need their savings first of all to deal with shocks such as illness and unemployment. Only when people are guaranteed a minimum level of social protection against the most severe risks, they will be ready to invest in means of production and education, even more so in view of the default risks that go along with such investments, which are often an additional barrier for low-income households to make such investments. This is why the famous English economist Arthur Pigou identified social protection as the “forgotten production factor”. It is not something that follows economic growth, but rather is a factor that enables economic growth – and in particular pro-poor economic growth. Finally, social transfer schemes are a good investment for another reason as well – namely because they stabilise state and society, thereby also creating the necessary general conditions for investors. They have very positive effects on the social inclusion for disadvantaged individuals by enabling them to participate in education, health care and social and economic life. This increases satisfaction among citizens, along with their acceptance of the existing social and political order and reduces the risk of uprising and war. International donors should therefore support middle-income countries in the creation and extension of social transfer schemes by providing advisory services and limited financial incentives. Most of these countries can finance their social transfer schemes themselves. Low-income countries, however, depend on the donor community in financing even current transfer payments. As a minimum contribution, donor countries could at least top up these transfers whenever external economic shocks and natural disasters occur or are likely to occur. It is in Europe’s own interest to extend social transfer systems in developing countries. The long- term sustainable stability to which they contribute matters, as it reduces the risk of additional civil wars, state failure and further reduces the incentives that people may have to migrate towards Europe. Markus Loewe is senior researcher in the “Transformation of Economic and Social Systems” programme at the German Development Institute (DIE) with a focus on social protection and pro-poor and inclusive growth. Next PostNext Will the Future EU Budget Water Down the Consensus on Poverty Reduction and Sustainable Development?